In DC Comics Bombshells, an alternate history series, Kara Zor-El lands in Russia instead of the U.S. and is raised as Kara Starikov. She's still the fierce but good-hearted Supergirl you love, in retro 1940s style! 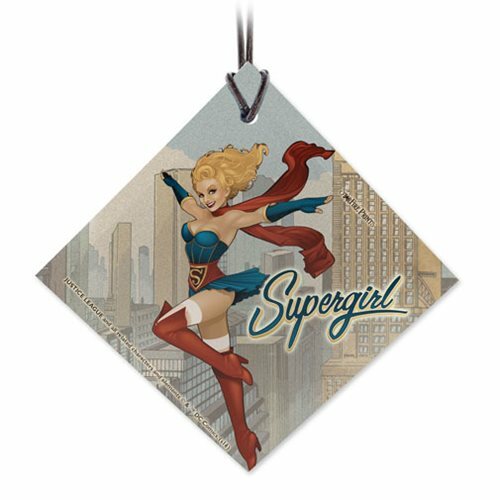 Bring the DC Bombshells to your window or tree with this DC Bombshells Supergirl StarFire Prints Hanging Glass Ornament. Translucent yet vibrant with color, the light-catching properties of the glass ornament illuminate the image and make for a perfect Christmas tree ornament or year-round décor, and it comes with a hanging string for easy display. StarFire Prints hanging glass are photographic quality prints on translucent glass. Featuring artwork from your favorite movies and more, they're an elegant way to display your fandom to the world. The images are permanently fused into the glass, resulting in a semi-translucent print that captures the natural light, enhancing the color display and making each image a true piece of art. The glass is scratch and fade resistant and arrives to you ready for display.